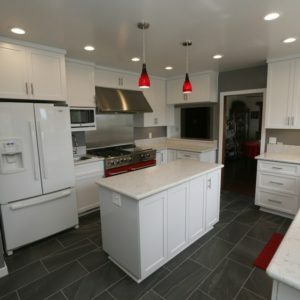 Depending on the scope of your project,Kitchen remodeling in Laguna Woods CA has the potential to involve many challenging tasks, from installing perfectly level countertops and cabinets to rerouting plumbing and gas lines. Naturally, you need an experienced contractor like Cabinet Magic to make your project a success. As a licensed contractor, we can take you through every phase of the project with ease, from the initial design planning to sourcing the best designer materials–including custom cabinetry–to installing and finishing everything to a high standard. When you’re just changing one aspect of your kitchen, such as your countertop or your flooring, it’s not too difficult to imagine the finished result. However, the more complex your kitchen remodeling in Laguna Woods CA is and the more aspects of the kitchen you change, the harder it is to really visualize what you’re getting yourself into. After all, samples can look quite different in your hand than installed in your kitchen. At Cabinet Magic, we understand how important having an accurate visualization of the finished kitchen remodeling in Laguna Woods CA is for your comfort and peace of mind. That’s why we always bring proposed kitchen designs to life using 3D rendering software. You’ll be able to see and approve all aspects of the design down to the last detail before we begin work. Would you like more information about working with Cabinet Magic on your kitchen remodeling in Laguna Woods CA? Call us at 800-828-4380 or contact us online to schedule a free in home consultation. We can help you price the upgrades you want and give you a free estimate.